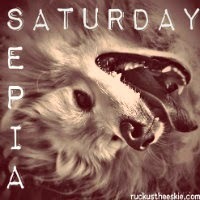 Ruckus the Eskie: Sepia Saturday #95: Careful, Could Start a Fire with Those Sticks! Sepia Saturday #95: Careful, Could Start a Fire with Those Sticks! So cold here last night we started a fire with real sticks. But bully sticks for the pooches taste much better. Those are a lot of sticks. If you need help finishing them off, let us know! BOL! You're not foolin' anyone! You just don't want to share that haul! Hey, Ruckus! It's getting that time of year you'll want to have a big supply of sticks to start a fire to keep warm. Awesome pic Ruckus! We would love to share some of those "sticks" with you! !